Stainless steel insulation cup custom_Sports bottle customization_Car cup manufacturer_Stainless steel lunch box manufacturer_Zhejiang Jiakang Stainless Steel Products Co., Ltd.
Zhejiang Jiakang Stainless Steel Products Co., Ltd. is a professional manufacturer of high-vacuum stainless steel insulation cups. The company has strong product design and development capabilities, can quickly meet the customer's new product development, the company now has an area of ​​over 20,000 square meters, plant construction area of ​​over 10,000 square meters. 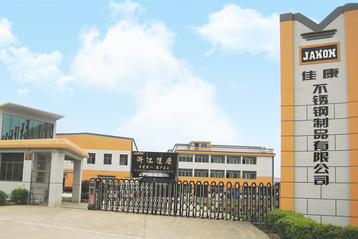 More than 500 production employees, there are 6 production lines , 2 sets of vacuum equipment and 4 packaging lines and many other equipment, and the introduction of domestic and international advanced level of automated assembly line, specializing in the production of stainless steel high vacuum products. Production capacity of 20,000 a day, the annual turnover reached tens of millions of dollars. Our company passed the ISO9001:2000 quality system certification, and has more than 10 national independent intellectual property patents. My company's products have eight series of more than 100 varieties. They are: stainless steel high-vacuum bullet cup, bachelor cup, office cup, travel pot, wide mouth pot, pressure pot, coffee pot, coffee cup, sports pot, car cup , jug and other products. All stainless steel products are made of high quality stainless steel imported from South Korea and Japan. Advanced product technology, sophisticated production, new and practical, beautiful and generous. For the domestic market, the company's professionally-produced "Jiankang" brand products are designated as "designated products" by the Asia-Pacific President and the Mayor of the International Cooperation Summit of the People's Republic of China in February 2006 for their excellence. It is the best choice for your indoor and outdoor sports. With excellent quality, classic styling and elegant taste, we have won the favor of domestic customers and consumers. For foreign markets, people-oriented management, honesty, mutual benefit, innovation, high quality business philosophy, professional commitment to meet and strict production of different national standards of products, products are sold to the European Union, the United States, Canada, South America, South Korea, Southeast Asia, Japan Markets such as countries and regions. At the same time also for a number of internationally renowned brand companies provide licensing processing services. My company's business integrity, prompt delivery! Sincerely eager to work together with friends from all over the world for common development!